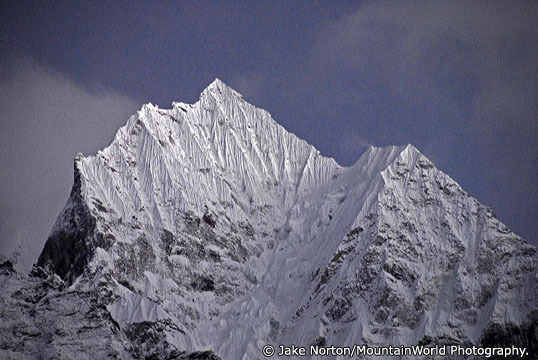 posted by Jake Norton on October 22,2007 in Everest Rocks! As I sit this morning watching the soft light of dawn splash elegantly on the jagged ridges of Kwangde, Numbur, Thamserku, and Kusum Kangguru, I am easily reminded of why I come back to this mountain paradise again and again: Simply put, spending time in the high mountains reduces life to the bare essentials. The superfluous elements which we often find ourselves concerned with and stressed out about are revealed for just what they are: superfluous elements. In the mountains, life becomes simple: take a breath, take a step, eat, drink, breathe, and enjoy the company of good friends – some new, some old. And, most importantly, to live in the moment, for as the adage goes, life is short. Being on this trip with cancer survivors, caregivers, and concerned people has only served to bring that point home for me. Life is indeed short. At times it can be harsh. It can hurt. It’ll make us cry. But, it is all we have, so we must not forget to live it, to embrace each moment as if it were our last. We must laugh hard and at times cry harder. 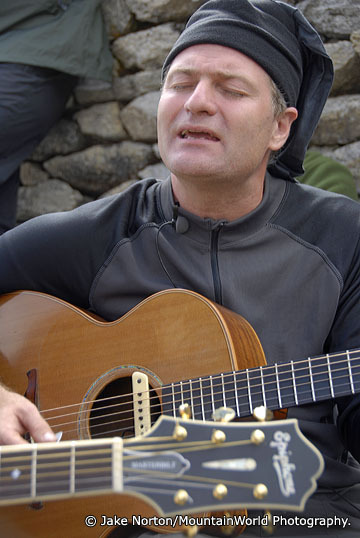 This afternoon, Nick Harper delivered a stunning and emotional impromptu performance of a new song he had not shared before, one of remembrance of his mother who passed away from cancer some years back. Our group of 37 plus many other onlookers shared Nick’s emotion as he sang on the deck of the Everest View Hotel above Syangboche. Everest was hiding, but no one cared. The moment was fresh, raw, and real…and exactly as it should have been. The stories of survival and hardship, joy and tragedy we have shared on this trip have underscored the need to embrace life, for tomorrow it could be far different. Our group here knows that truth better than most…and is living it today. May we all try to live life fully, to embrace each day as if it were our last, to live, love, and laugh with all that we are, for who knows what lays behind the next turn in the trail. Look to this day, For it is life, the very life of life. In its brief course lie all the verities and realities of your existence; the bliss of growth, the glory of action, the splendor of beauty. For yesterday is but a dream And tomorrow is only a vision, But today well lived makes every yesterday a dream of happiness and every tomorrow a vision of hope. Look well, therefore to this day, such is the salutation of the dawn. I read your post and loved it. While the words of the “Sufi” and of Sogyal Rinpoche are eloquent your words are very uplifting also. If you had not visited my site I would not have had the opportunity to discover your wonderful Blog. Life is like that. THank you for your comments, I have posted them on the site with the link. Leave a Reply to Nick Grimshawe Click here to cancel reply.